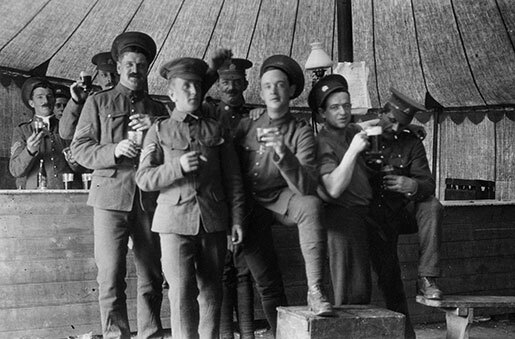 Canadian soldiers imbibe in a beer tent in England during the First World War. Beer had long been seen as essential for maintaining the physical and mental health of the troops. During the First World War, while commanding the British Empire’s Egyptian Expeditionary Force, Lord Allenby recognized the importance of beer as a beverage for Tommy Atkins. One of Lord Allenby’s first actions was to order beer to be shipped to his soldiers in Palestine. Exposed to the burning heat of the semi-tropical terrain over which they were forced to fight, the troops experienced an appreciable lowering of physical resistance and morale owing to the trying climatic conditions. But not long after the arrival of the first shipments of beer there was a noticeable improvement in their general condition. 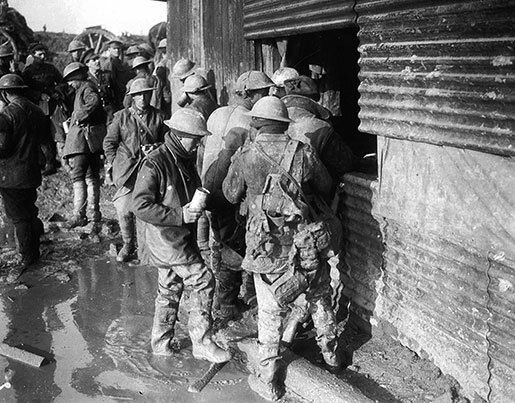 Lining up for a brew, November 1916. On the basis of this First World War experience, at the beginning of the Second World War the British government decided that beer was “essential” to the welfare of the nation at war. On the other side of the debate were the brewers and their allies, particularly among the workers, active servicemen and veterans of the nation. In the summer of 1942, John S. Labatt, the president of the brewery that bore his family name, congratulated his fellow brewers for supplying some cold comfort to the fighting men in hot theatres of North Africa. 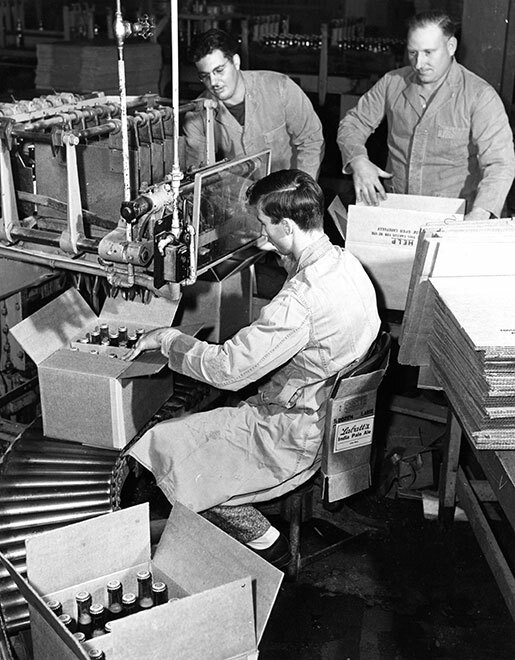 Beer is packaged during the Second World War. 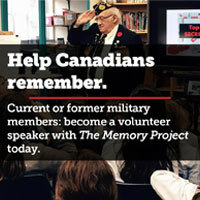 Supplying beer to the troops had the support of many members of the federal government. In the House of Commons, the Minister of Finance, James Lorimer Ilsley, stated that he saw nothing wrong with shipping beer to the troops overseas. To deny beer to those who were putting their lives on the line for freedom was a position that Ilsley considered “wholly reprehensible.” The brewers also had the support of dynamic cabinet minister Clarence Decatur Howe. A Massachusetts Institute of Technology-educated engineer, C.D. 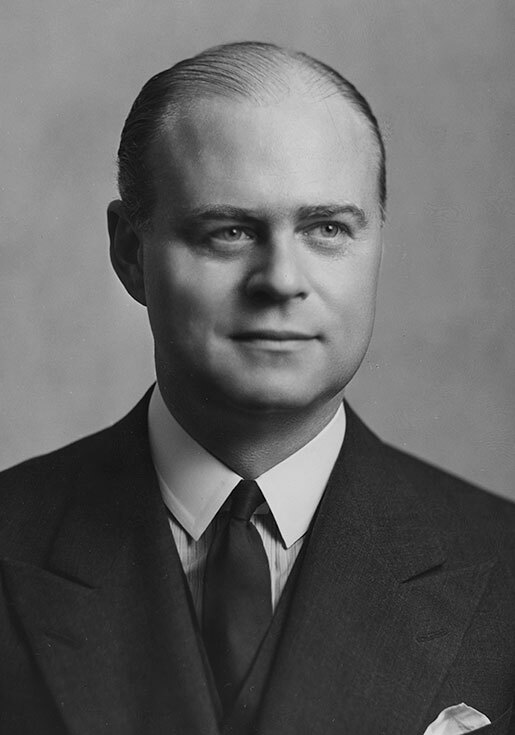 Howe had been elected to public office when Liberals were swept back into power in the midst of the Great Depression on the platform of “King or Chaos.” After his electoral victory, Howe became a rising star within the Liberal party. In April of 1940, as the “phoney war” in Europe began to be overtaken by the reality of total warfare, Howe was named minister of munitions and supply, thus crowning him as the central planner in what was to become a planned wartime economy. Howe was a guy’s guy—a man who enjoyed male company, sports and drinking the occasional bottle of beer. His circle of friends included more than one brewer. He was particularly close to Edward Plunkett (E.P.) Taylor—a brewing tycoon, who was later dubbed Excess Profits Taylor by his critics. In June of 1940, Taylor joined Howe’s Department of Munitions and Supply as a dollar-a-year man. On the issue of beer production and consumption, Howe felt that the existing liquor laws were satisfactory. He also supported the shipment of beer to the troops overseas. Thus the brewers had some powerful allies within King’s wartime cabinet. On Sept. 14, 1942, King entertained a delegation of temperance advocates at his residence in Ottawa. During the meeting, the delegates pointed to a “disturbing trend” in wartime consumption. Beer consumption was up—way up—they noted, since the beginning of the war. Nationwide, each Canadian was now consuming on average 8.7 gallons of beer per year. That was an increase of almost 50 per cent since 1939. As a result, the brewers were making unprecedented profits. The statistics confirmed what King had suspected: “The brewers have profited more than anyone out of the war,” he wrote in his diary. And thus he decided something had to be done. 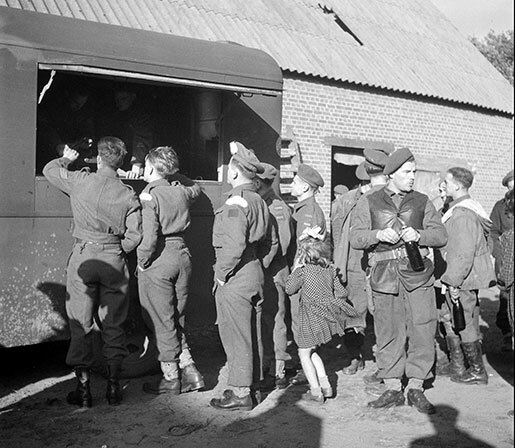 Canadian soldiers collect their beer ration at a canteen in the Netherlands, September 1944. King had lost faith in the ability of the population to control itself. And while he was not willing to impose prohibition, he was ready to regulate the amount of beer that each Canadian could consume by curtailing domestic production. On Dec. 16, 1942, King executed the Wartime Alcoholic Beverages Order (WABO). The Order-in-Council restricted the annual volume of beer sold by each brewery to not more than 90 per cent of its sales in the previous year. At a time when the nation’s breweries were operating at close to capacity, the order meant that there would be less beer available for the home market. A bottle of beer and a sign urging the hiring of more help to dispense the popular drink. A prohibition parade in Toronto, March 1916. Was this sabre-rattling on King’s part, or was he set on nationalizing one of the oldest, most successful and most diverse industries in Canada? 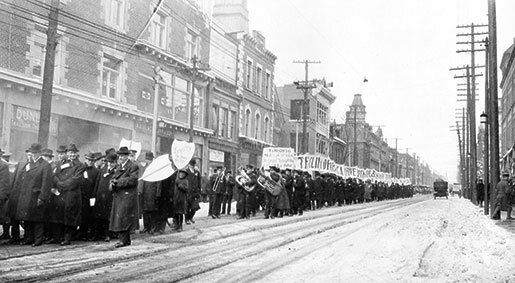 To be sure, nationalization of the breweries had the support of Canada’s socialist party, the Co-operative Commonwealth Federation (CCF), as well as some within the temperance movement. By nationalizing the brewing industry, King would spike the guns of the CCF. The federal government had nationalized private businesses in the past, and thus there was a precedent for King’s proposed actions. But the brewing industry was a different economic animal than those that had been owned by the state in the past. The brewing industry was a vibrant economic concern. Furthermore, it was one thing to create a state-owned and -controlled enterprise from scratch, as C.D. Howe had done in 1942, when he founded Canada’s sole manufacturer of synthetic rubber. But it was an entirely different thing, politically and philosophically speaking, to nationalize an existing industry which had a long and venerable history. Even C.D. Howe had problems with the plan to nationalize the breweries. “Temperance is essential, if the services of men and women are to be employed to the best and most useful effect according to the physical capacity and ability of each. Thus nationalization would have alienated as many people as it pleased. It would have brought the wrath of the beer lobby; it would have divided King’s wartime cabinet, the Liberal Party, and the nation. King realized this. By threatening nationalization, he hoped to “bring the brewers to their senses;” to make them grateful to him for instituting the WABO, instead of doing something far more draconian. Within a few weeks, the effects of the WABO were noticeable. Long lineups outside of beer stores became a common occurrence. On the morning of Saturday, March 6, 1943, for example, 200 men and women waited outside of the warehouse on St. Paul Street in St. Catharines, Ont., in the hopes of purchasing some beer before supplies ran out. At the opposite end of the province, the proprietor of the Arnprior hotel (which housed the province’s largest beverage rooms—the only spaces where public drinking could legally take place) was finding it impossible to keep his patrons’ glasses full and, as a result, he decided to close two full days a week. In Toronto, hotels that used to be half empty on Saturday afternoon were now crammed with patrons from lunchtime onwards. The hotels stayed open until the beer ran out. Often this did not take long. At the Brunswick Hotel on Bloor Street West, for instance, the supply usually ran dry just before 7:00 p.m., at which point the doors were closed. 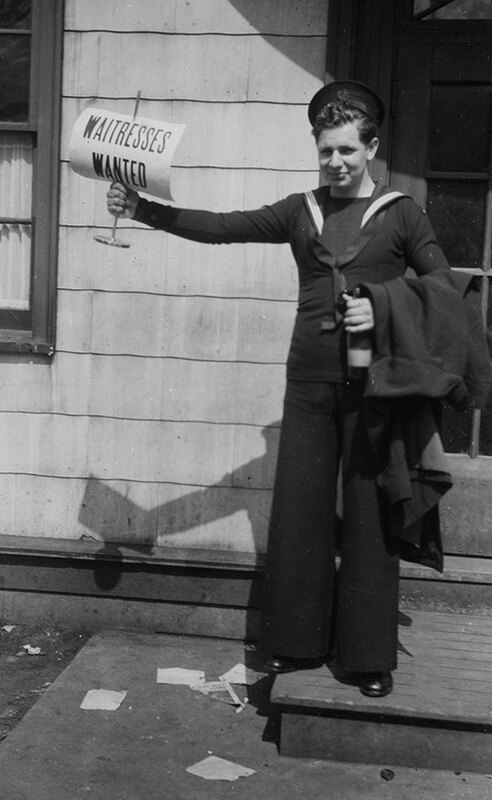 The beer shortage brought an outcry from workers, who threatened to boycott the sale of victory bonds. “No Beer–No Bonds” was their battle cry. Across the nation, wartime workers and veterans signed petitions to register their disapproval of the beer restrictions. 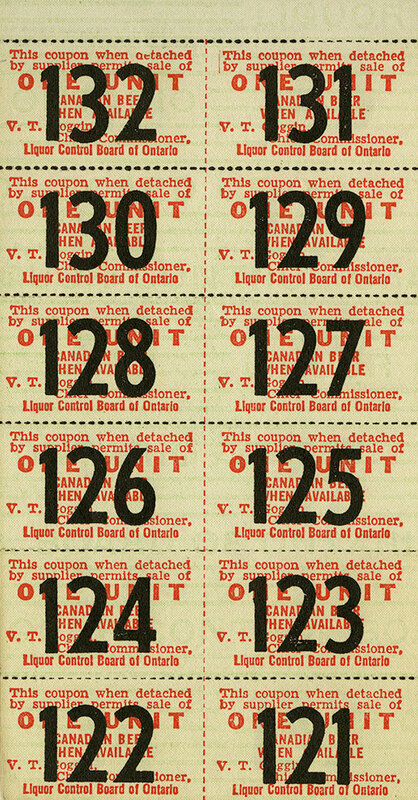 The cover of a beer ration coupon book. With a federal election looming, King decided that he could not afford to continue to alienate the wet vote. As a result, on March 13, 1944, he stood in the House of Commons and declared that restricting the supply of beer “is not sufficiently important to the war effort to justify the risk of continuous misunderstanding and friction…” Always sensitive to the prevailing political wind, King had reversed course and lifted the beer restrictions. No other shortage brought more of an uproar during the war than the scarcity of beer. Many Canadians proved willing to do without a multitude of goods and services but the inability to get a glass of beer after finishing a day’s work was something that a majority of the population could not stomach. Their protests were many and frequent.